Ashraf Ghani was inaugurated as president of Afghanistan today. He quickly appointed his rival in the bitterly contested runoff election, Abdullah Abdullah, as government’s chief executive officer, a Prime Minister-type position created as part of a compromise brokered by U.S. Secretary of State John Kerry. 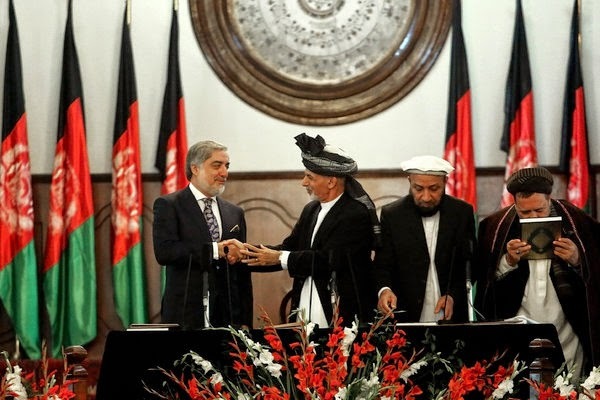 President Ghani declared a halt to the degeneration of relations with the United States under the departing president, Hamid Karzai, who refused to sign a long-term deal to keep American troops in Afghanistan. “Now it’s time that we enter a new era of our relationship with the United States, Europe and other countries of the world,” Ghani said.